HOFFMANN'S original book was effectively a catalogue of most of the puzzles available in Victorian London in the 1890s together with their solutions, plus many excellent new and classical puzzle posers. Published in 1893 it had only one edition; but it went through at least two printings, as some copies are dated and some are not. The original hardback binding had two different pictorial covers which were done on four different colours. Geïllustreerd met 521 figuren in de tekst.". This rare Dutch edition probably dates from about 1900 and does not contain all the puzzles in the original. 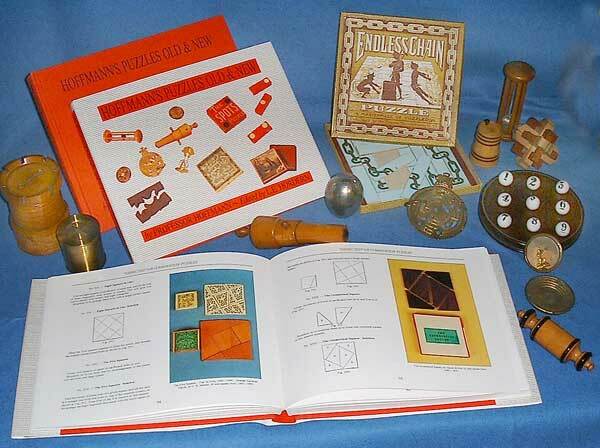 Subsequently three of the parts were republished in card covers as "Arithmetical Puzzles", "Mechanical Puzzles" and "Miscellaneous Puzzles". These later editions were being sold in the 1920s and possibly as late as the 1930s. These three books did not contain all the material in the original volume. Edward Hordern reprinted the original in 1988 in hardback. He also released a limited edition in a red presentation slipcase. In 1993, on the 100th anniversary of the original publication, Edward Hordern privately published the Centenary Edition ( illustrated below). Hoffmann's original text contained may mistakes; and with the help of fellow mathematicians and puzzle collectors Edward Hordern corrected all that were found. This edition also includes photographs of many of the original antique puzzles that Hoffmann described, taken from the Hordern and other collections. This book will not only provide months of puzzling, but is also a wonderful reference work for puzzle collectors, designers, and people wishing to make their own puzzles. Large Landscape format 25 x 20 Cm. (10 x 8 inches). Hardback binding with dust jacket. Printed on high quality paper The 256 pages include over 400 puzzles and their solutions (52 Mechanical puzzles, 41 Dissected or Combination Puzzles, 112 Arithmetical puzzles, 16 Word & Letter puzzles, 27 Counter puzzles, 19 Match puzzles, 12 Wire puzzles, 45 Catch puzzles, and 48 Miscellaneous puzzles). A "Must Have" for anyone seriously interested in puzzles. We still have a few copies of this rare edition for sale. A new fully cross-referenced index to all the editions is in progress.